released in 1985-2015 EU repressed on 180g LP+MP3 -the band's fine debut, including "Take On Me," "The Sun Always Shines on TV," "Train of Thought" and "Hunting High and Low." 2015 EU repressed on 180g LP-A-ha’s 1985 debut, Hunting High And Low, featuring the classic tracks "Take On Me," "The Sun Always Shines on TV," "Train of Thought" and "Hunting High and Low." Formed in 1982 by Morten Harket, Paul Waaktaar-Savoy and Magne Furuholmen, Norwegian new wave band A-ha went on to become one of the biggest pop acts of the 1980s. This was a huge hit one day and still a great album of simple and warm pop music. Recommended together with Scoundrel days (their next album). B1. The Sun Always Shines On T.V. Anyone who dismissed a-ha as a one-hit wonder must have missed out on the band's fine debut, Hunting High and Low. Though the band spawned many further hits across the rest of the world, "Take on Me" exploded in the States and the group never cracked the top of the charts again. It's a shame, because the album contains a handful of songs that nearly match the manic energy and emotional crack of its big hit. Further, it's a cohesive album with smart pace changeups, and it rarely fails to delight or satisfy a listener's need for a synth pop fix. The opening kick is a huge one: "Take on Me" is a new wave classic laced with rushing keyboards, made emotionally resonant thanks to Morten Harket's touching vocal delicacy. It didn't hurt in the era of MTV that the song's video was a hyperkinetic blend of mind-warping animation and filmed footage with a romantic thriller's heart. Harket's hunky physique and cheekbones also didn't hurt the video's chances at heavy rotation. Getting past that video, "The Sun Always Shines on T.V." is just as thrilling. Starting as a sad ballad, it explodes into something much more, as chugging guitars and operatic synths keep pace with Harket's evocative vocal stylings. If ever a 1980s song qualified as Wall of Sound, "The Sun Always Shines on T.V." would be it. The remainder of the album sees a-ha switching deftly back and forth between dramatic overtures and classic new wave keyboard motifs. 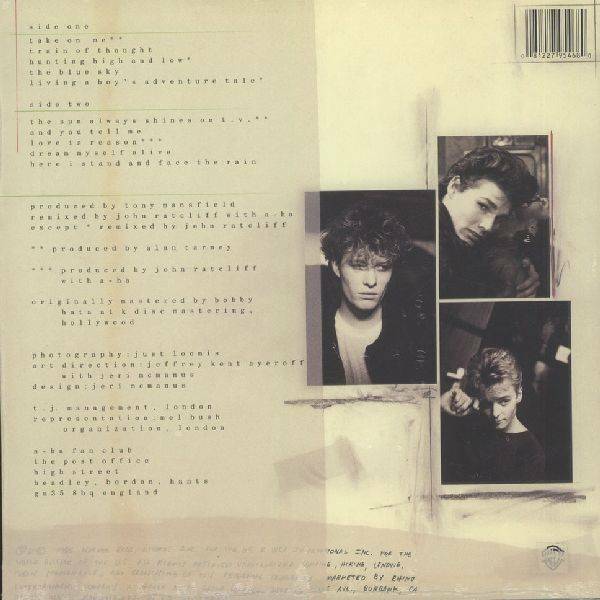 "Train of Thought" and "Love Is Reason" are reminiscent of early Depeche Mode or Camouflage, but Harket's rich voice and flair make them purely a-ha. The band explores decidedly European terrain in the theatrical "Hunting High and Low" and dances a pop waltz with the sweet "Living a Boy's Adventure Tale," coming across like a marriage between the Blue Nile and Alphaville. Delightful song snippets "The Blue Sky" and "And You Tell Me" act as frosting on the cake or as glue between the theater and the dancefloor. One can't escape the feeling that Hunting High and Low is a product of the 1980s, but with highs like "Take on Me" and "The Sun Always Shines on T.V.," and no lows in sight, a-ha's debut is a treat worth relishing.